Prepare to be swept away by a story that is intimate, true, and compelling. Margi Gibb's much-loved father dies and, with her immediate family largely gone, her life is changed irrevocably. Immersing herself more deeply in art and music, she travels to America to study the sacred art of the mandala, exploring the wisdom traditions of Indigenous Indian peoples in the process. Then after a serendipitous encounter back in Australia she travels to Dharamsala to care for children in an after school program at a Tibetan women's handicraft cooperative. Her underlying passion is to initiate guitar lessons for Tibetan refugees. What follows is unexpected. Margi's developing bonds with two very different Tibetan men, Tenzin and Yonten, change her life in complex and enduring ways. Eventually she journeys to Tibet. Margi Gibb was born in the Victorian high country. She is a singer, songwriter, visual artist, adventurer, survivor, writer and educator. 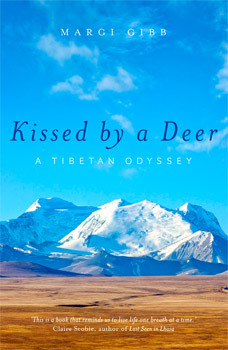 An earlier version of Kissed by a Deer was written as the creative product of her PhD. It is her first full length work of non-fiction. Margi currently lives in Melbourne, Australia, where she works as a learning advisor for an international college. Question: What inspired you to write your travel memoir? Margi Gibb: I didn't set out to write a travel memoir. Originally I was planning to write a collection of short stories. My intention was overturned three months into the writing process when I found myself writing a full length book: the story had to be told. It was as though I was no longer in control of the creative process but, rather, the creative process was in control of me.Kissed by a Deer is a response to asking the question – `how did I get here?' – the stage of life Jung called the mid-life transition. It`s not so much an answer to the question' as an attempt to make sense of the search. Question: Was it difficult reliving certain aspects of your life whilst writing Kissed by a Deer? Margi Gibb: Yes it was, particularly having to continually revisit a difficult relationship, and relive a time in my life when I carried the weight of grief. Writing the story helped to put a lot of things to rest, but at the same time I feel incredibly vulnerable. Question: Can you tell us about why you decided to teach guitar and music to Tibetan refugees? Margi Gibb: I had worked as a community artist and musician for many years. Playing music: preforming and teaching – guitar, singing and song writing was what I did, so it was natural for me to want to share this with the Tibetan people. They love music: it captured their sadness, their strength, their joy, and their love for Tibet and all things Tibetan. Question: What do you hope Australians take from reading Kissed by a Deer? Margi Gibb: Among other things a greater knowledge and understanding of what is happening in Tibet and the hardships, difficulties and triumphs of the Tibetan people. I am grateful to have lived the story in Kissed by a Deer; my hope is that readers will, with me, wonder at mysterious experience of being alive.